The Royal Palm Reserve is one of Jamaica's leading Eco-tourism attractions. The Reserve is an amazingly beautiful and tranquil forest within the Negril Great Morass. 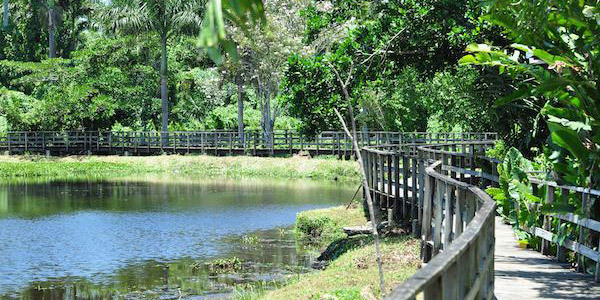 This 300-acre site boasts 114 plant species including the Royal Palm found only in this area and over 300 animal species including birds, butterflies and reptiles. The Royal Palm Reserve was conceived as a part of the overall proposal for mining of peat in the Negril Great Morass during the mid-1980's. At that time it was recognized that the stand of Morass Royal Palms (Roystonea princeps) at the south-western corner of the Morass was a remnant of a once much larger wetland forest that had been extensively logged and cut down in previous years. The Morass Royal Palm is endemic to Jamaica - its distribution is restricted to the Negril Morass and other wetlands in western Jamaica. Because of the very restricted distribution of the palm in global terms, the Petroleum Corporation of Jamaica (PCJ) decided to establish the Royal Palm Reserve so as to protect the Morass Royal Palm in Negril. PCJ therefore designed and constructed an access road from Sheffield, a board-walk through the wetland forest, a lake and buildings around it -restaurant, museum and administrative office, in addition to a Reception Centre on the bank of the South Negril River. Construction was completed in 1989, however the facility has never been formally opened or used since then, due to a change in mandate of the PCJ. This eventually led PCJ to offer the property for lease in 1994, at which time, a newly formed NEPT tendered a bid. The bid was unsuccessful and the lease was given to a private sector company which gave up the lease after about two years of unsuccessful management. Over the years, NEPT continued to indicate its interest in managing the Reserve and finally obtained the lease starting on January 1, 2001. The Royal Palm Reserve has been extensively studied in terms of its ecology, geology and hydrology. There are numerous documents that have been prepared, particularly by the PCJ about the Reserve.